Teddy Boy, Yoji Ishii’s follow-up to Flicky, is all about controlling chaos. 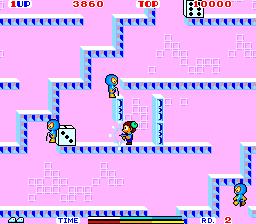 As a boy inside of a toy-infested labyrinth, wielding a small gun and wearing a silly hat, the goal in each stage is to destroy all of the enemies. These spawn from dice that count down from six to zero before disappearing, bounce around haphazardly, reflecting off floors, walls, and ceilings. While each stage is small, they loop infinitely in all directions. These bad guys, which spawn from dice that count down from six to zero before disappearing, bounce around haphazardly, reflecting off walls and ceilings. Shooting them won’t immediately kill them, but instead shrink them into little balls. In this state, they are harmless, but if you let them sit for too long, they will turn into flies and literally eat the timer at the bottom of the screen. If you can collect multiple balls in succession, you’ll double the points for each pick-up, leading to much higher scores. This trick is easiest with the enemies that spawn six at a time and bounce around in unison. Other enemies include snails, which irritatingly hide in their shells to absorb shots, and yellow sponge things, which must be shot several times at once in order to kill them. Shooting foes won’t immediately kill them, but instead shrinks them into little balls. They’re harmless in this state, but if you let them sit for too long, they turn into flies and literally eat the timer at the bottom of the screen. If you can collect multiple balls in succession, you’ll double the points for each pick-up, leading to much higher scores. With enemies flinging themselves around in every possible direction, you’re constantly under pressure. The best strategy to kill your opponents is to find a spot that’s relatively safe – that is, positioned in a narrow passage that makes it easy to shoot through, but hard for enemies to navigate. 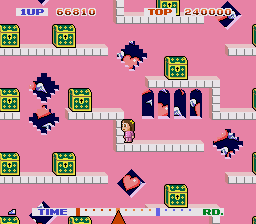 Parts of the stage include destructible walls to help facilitate this. 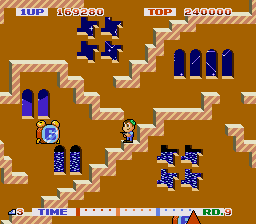 Beyond the timer and the need to collect destroyed enemies, though, the floor will disintegrate if you stand still for too long. Since the enemies move far faster than Teddy Boy, and his gun isn’t all that versatile, it produces a flow where you’re constantly running in and out of cover, hoping you won’t get forced out into the open. As such, Teddy Boy is far more clever than it looks. But like many mid-80s arcade games, outside of speeding up and introducing new enemy types, it doesn’t change its gameplay. There are fifty levels in total, which loop infinitely. You are only granted three lives, and with no continues, getting high scores is important to get extra lives. The graphics have sort of a kid friendly appeal, although there is something disconcerting about the never-ending landscape. The English manual text even says that it’s meant to be a nightmare. 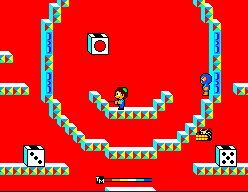 The visual style is similar to the later title Alex Kidd in Miracle World, to the point where the bouncing daruma enemies are practically identical, so they may have shared design staff. 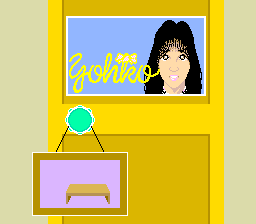 In Japan, the game’s biggest claim to fame is its association with one-time pop star Yoko Ishino. 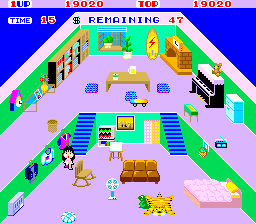 The game’s name was based off one of her songs, “Teddy Boy Blues”, and she even appears on the title screen in the arcade version, her name appearing in the digital equivalent of neon lights, and the enemies playing as various parts of her ensemble. 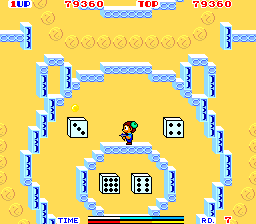 A chiptune rendition of her song is even played during the game. Otherwise, it has nothing to do with the British “teddy boy” fashion style. 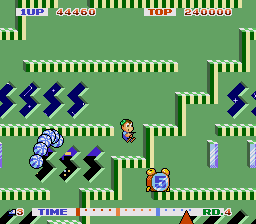 Sega had previously plagiarized other popular songs in their arcade games – Yellow Magic Orchestra’s “Rydeen” in Super Locomotive, and Gershon Kingsley’s “Popcorn” in Pengo – both suiting their respective games. Here, while “Teddy Boy Blues” is their first instance of officially licensing a song, it’s a little slow and doesn’t feel very video game-y. 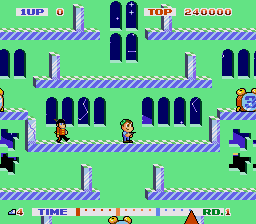 The concept, at least according to the Japanese manual, is that Teddy Boy and Yoko are trapped inside of a maze. Yoko is too scared to help herself, but instead elects to cheer Teddy on with her music. 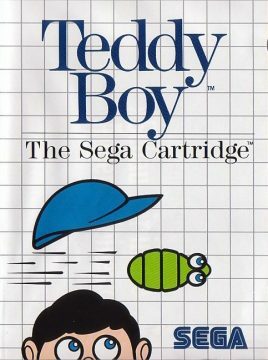 While Teddy Boy originated in the arcades, it was also ported to the Master System. 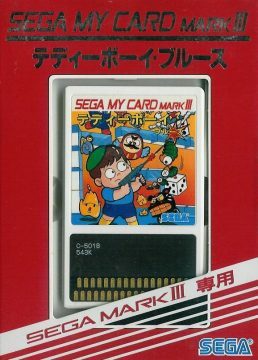 It was initially released in card format, as one of the early releases for the platform, but was later converted to cartridges for the PAL market. The animation isn’t quite as nice, and the backgrounds are just a single color. Plus, the larger enemy sprites are a bit smaller, but in general it’s just a small downgrade. 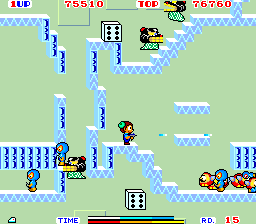 Some of the level layouts are different too, though many are similar. It’s also missing the fancy title screen. The only area where it really diverges is with its bonus stages. 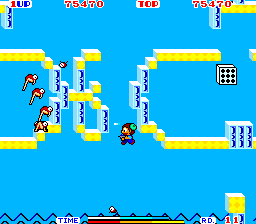 In the arcade version, you get to pick between two mini-games. 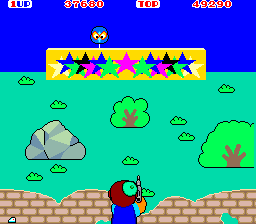 One is an over-the-shoulder shooting gallery with Teddy Boy, where you mostly shoot cardboard cutouts of assorted enemies, though there are cameos from Flicky and Pengo, two earlier Sega arcade games. The other is a treasure hunt with Yoko Ishino, as you rummage through a small house in order to find treasure. Yoko’s stage is particularly amusing because her eyes bounce madly as she moves, making her seem like something of a crazy person. 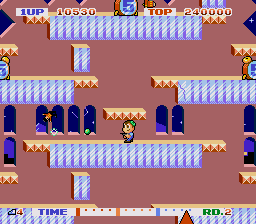 Both of these use unique perspectives separate from the main game, but the SMS version keeps things more consistent, as they look like regular in-game stages. 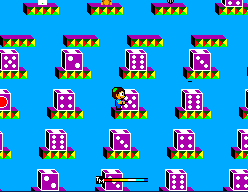 Playing as Teddy Boy, the goal is to simply to destroy the many dice throughout the stage to find toys, though sometimes you’ll uncover bugs to more quickly eat up the timer. 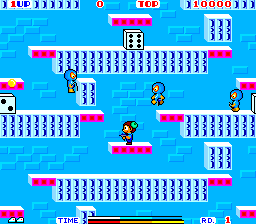 The SMS port was released outside of Japan, though the game was changed to simply Teddy Boy. The main theme was swapped out to something totally different, thereby eliminating any association with Yoko Ishino, so this version has two new songs: one for the title screen and the other for in-game music. 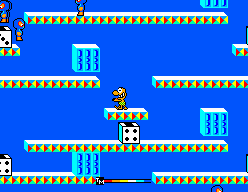 Teddy Boy was also released in Brazil for the Master System, though it was changed to tie in with the popular comic strip Geraldinho. 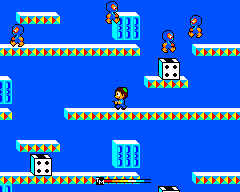 Other than the title screen and Geraldinho replacing Teddy Boy as the main character, the games are visually identical. It also grants five lives at the outset, rather than three. 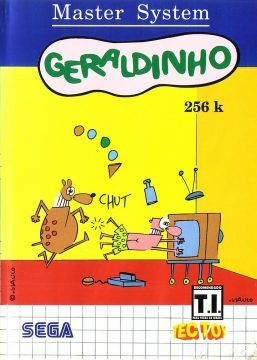 Based off the cover, the concept appears to be that that Geraldinho has been kicked inside of his television and needs to escape from the video game he’s played. 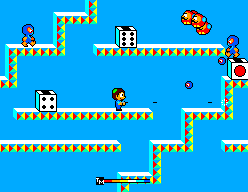 Teddy Boy Blues was also ported to the Mega Drive, though through a variety of non-standard channels. 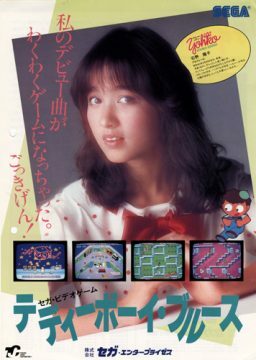 It was first published through the online Sega Net service, essentially a downloadable game channel, though only in Japan. It was then compiled with other titles from the service on the Mega CD release Game no Kandume Vol. 2. Finally, it was also included as a bonus on the SING!! SEGA Game Music CD album. The album itself features several arranged Sega songs courtesy of Japanese band B.B. Queens, including tracks from OutRun, Earnest Evans, After Burner and Golden Axe II. These are all incredibly amazing, largely because they feature impossibly cheesy lyrics sung in heavily accented English. 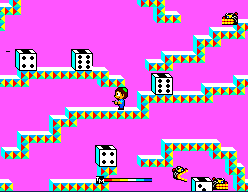 The first track is the data track containing Teddy Boy Blues, allowing you to play the game on a Mega CD. 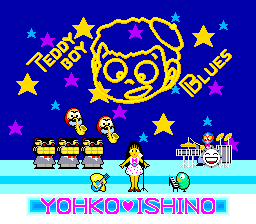 The second track claims it’s an image song for Teddy Boy Blues, named “Funky Brothers”, though the song itself is completely different from Ishino’s original tune. It’s actually much catchier, and more suited to the game. All three versions are mostly identical, though the version featured on SING!! includes the ability to listen to any of the CD’s tracks during gameplay. The Mega Drive version occupies a weird space, in that’s not really a port but not really a sequel either. The graphics are all new, with some multiplane scrolling visible in the background, though they hardly tax the capabilities of the system. The dice are now alarm clocks, and they spawn enemies much slower. All of the enemies are brand new, at least visually, since most act identically to the ones in the original version; the ninjas are now toy soldiers, the snapping dragons are now pumpkin heads, and so forth. 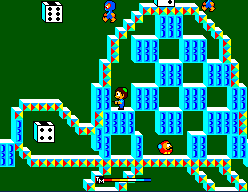 The level construction is similar, though generally there are many more destructible walls. 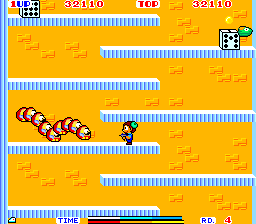 The bonus stages are also slightly different, though similar to the SMS version. Here you play as Yoko – probably a different Yoko than the arcade game, since it’s no longer affiliated with the pop singer – as she opens up treasure boxes to find goodies. In general, the Mega Drive version is substantially easier than its earlier counterparts, or at least takes quite a bit longer to ramp up the difficulty.